Will NASA's Next Space Capsule Land Like a Helicopter? An artist's illustration of NASA's Apollo re-entry rotor concept for controlled space capsule landings instead of ocean splashdowns. It looks like NASA is getting a little more creative with its landing systems. A team of researchers recently tested a new rotor landing system in the 550-foot fall Vehicle Assembly Building at NASA's Kennedy Space Center. The idea is for spinning blades to take the place of parachutes to enable soft and controlled landings on land instead of the ocean. The rotor re-entry and landing system is designed for capsule-inspired spacecraft like the Orion Multipurpose Crew Vehicle that should fly before the end of the decade. It's an appealing system because it marries the stability and control of a helicopter to the simplicity of an unpowered system; wind passing over the rotors as the capsule descends through the atmosphere is enough to make the blades turn. And keeping the airflow around the blades' hinges balanced is enough to ensure the blades don't wrap around the spacecraft when they hit the wind. This landing system's process is called auto-rotation, and while it's been proven on helicopters it's never been tried on spacecraft. But that's not for lack of interest. Right now, getting the blades deployed the right way is the challenge facing engineers. There are bombs that whose fins flick open at high speed, and engineers think a similar mechanism could deploy the blades and start them spinning almost immediately. At the same time, control fins on the side of the capsule would to keep it from revolving with the blades. Engineers are testing ways to get the rotors to start spinning with drop tests in the VAB. With the scale model capsule suspended 480 feet above the floor, engineers can use a helicopter radio-control unit to remotely changed the rotors' pitch and slow the capsule’s fall. Rotors could help recover spent rocket stages as well as spacecraft. The idea is to have rotors built into the booster frame and unfurled as the stage descends to Earth, the empty rocket just as controllable as a spacecraft for a soft landing. 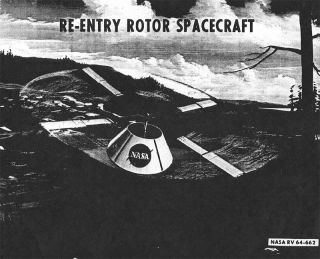 NASA considered this in the 1960s as well, but like the Apollo rotor re-entry it never got further than the planning stages. Future rotor re-entry test will get more complicated, eventually involving full-scale models dropped from high-altitude balloons. And before rotors bring astronauts back to Earth, the system will bring science samples to a soft landing from the ISS in small scale capsules. Some hope that this capability of sample return will give the rotor re-entry system a niche, though where this will fit with possible SpaceX Dragon capsules returning hardware from orbit isn't totally clear. One this is sure, it would be really neat to watch a rotor re-entry from orbit.